Advanced skills related to the wiring of multi-family and small commercial buildings. Includes instruction and practice in service entrance installation, specialized circuits, and the use of commercial raceways. Three semester credit hours. including the types of conduit and other raceways, NEC code requirements, and three-phase distribution networks. Three semester credit hours. The layout, format, rules, and regulations set forth in the National Electric Code. 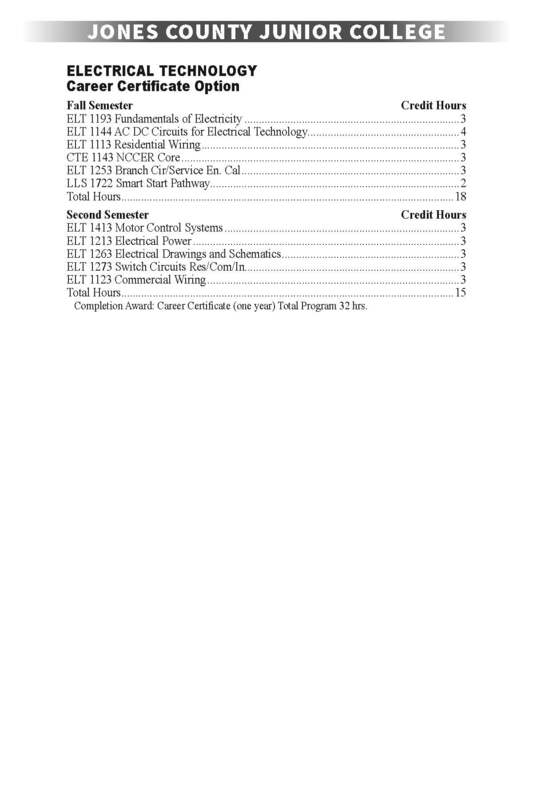 Emphasis is placed on developing the student's ability to find information in the National Electric Code and applying that information in real-world applications. Three semester hours. 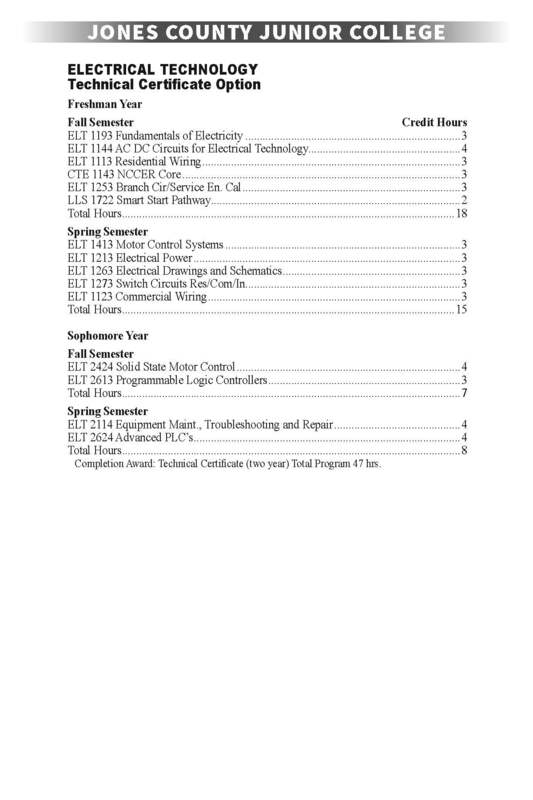 Principles and theories associated with AC and DC circuits used in the electrical trades. Includes the study of electrical circuits, laws and formulas, and the use of test equipment to analyze AC and DC circuits. Four semester credit hours. Fundamental skills associated with all electrical courses. Safety, basic tools, special tools, equipment, and introduction to simple AC and DC circuits. Two semester credit hours. Electrical motors and their installation. Instruction and practice in using the different types of motors, transformers, and alternators. Three semester credit hours. Principles and practice of electrical motor repair. Includes topics on the disassembly/assembly and preventive maintenance of common electrical motors. Three semester credit hours. Calculating circuit sizes for all branch circuits and service entrances in residential installation. Three semester credit hours. Architectural symbols and electric symbols needed to read blueprints. All elevations and various plans associated with electrical wiring will be studied. Blank blueprints will be provided and a list of all appliances and their amperage will be supplied. The blanks will be filled with receptacles, switches, and lighting outlets as required by NEC. Circuit layouts for all switching will be demonstrated. All branch circuits will be plotted on the blueprint. Three semester credit hours. Introduction to various methods by which single pole, 3-way, and 4-way switches are used in residential, commercial, and industrial installations. Also includes installation and operation of low voltage, remote control switching. Three semester credit hours. Cost of a residential installation. Specifications set forth for a particular structure. Three semester credit hours. Various terms related to measurement principles and calibration techniques used in the electrical industry. With PLCs, the topic also includes the procedures and calibration of various instruments and PLCs used in industry. Four semester hours. A general knowledge of instrumentation principles as they relate to the electrical industry. This course includes instruction in the basis of hydraulics and pneumatics and the use of electrical circuits in the instrumentation process. Three semester hours. Designed to introduce the student to industrial robots. Topics to be covered include robotics history, industrial robot configurations, operation, and basic programming and how they relate to the electrical industry. Three semester hours. Fundamentals of Robotics (ELT 1353) the operating systems and advanced programming methods of industrial robots. Actual industrial grade robots are used to train the student in the areas of operation, maintenance, troubleshooting, service procedures, and robotics applications. Three semester hours. student's ability to diagram, wire, and troubleshoot the different circuits and mechanical control devices. Three semester credit hours. Active devices that include PN junction diodes, bipolar transistors, bipolar transistor circuits, and unipolar devices with emphasis on low frequency application and troubleshooting. Four semester hours. Principles and operation of solid-state motor control. Also, the design, installation, and maintenance of different solidstate devices for motor control. Four semester credit hours. Use of programmable logic controllers (PLC's) in modern industrial settings. Also, the operating principles of PLC's and practice in the programming, installation, and maintenance of PLC's. Three semester credit hours. Advanced PLC course which provides instruction in the various operations, installations, and maintenance of electric motor controls. Also, information in such areas as sequencer, program control, and block transfer used in analog input and output programming, and logical and conversion instructions. Three semester credit hours. Practical application of skills and knowledge gained in other electronics or electronics-related technical courses. The instructor works closely with the student to insure that the selection of a project will enhance the student's learning experience. One to three semester credit hours. A cooperative program between industry and education and is designed to integrate the student's technical studies with industrial experience. Variable credit is awarded on the basis of semester hour per 45 industrial contact hours. One to six semester credit hours: Three to eighteen hours externship. Instruction in basic principles of hydraulics and pneumatics, and the inspection, maintenance, and repair of hydraulic and pneumatic systems. 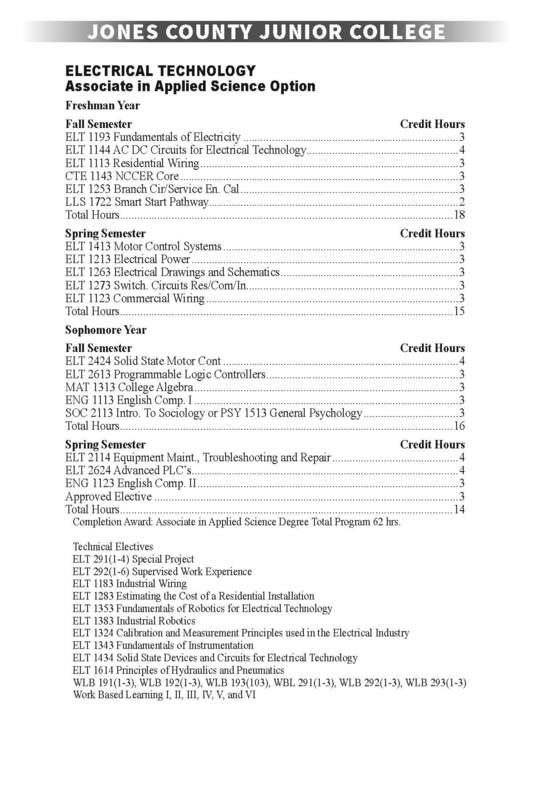 Four semester credit hours.